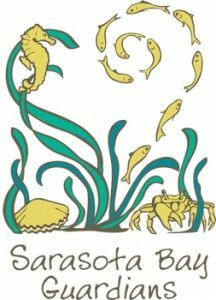 SARASOTA – The Sarasota Bay Estuary Program (SBEP) Bay Guardian volunteers will plant native Florida plants at Grassy Point Preserve in Holmes Beach on Saturday, October 10. SBEP project partners include Around the Bend Nature Tours, City of Holmes Beach, Manatee County Department of Parks and Natural Resources, and Chiles’ Restaurant Group. Native plants help restore local habitat which stabilizes shorelines and supports diverse wildlife species. Volunteers will also remove trash and other litter from the 34-acre preserve. The award-winning Bay Guardians Program is managed by SBEP in partnership with Around the Bend Nature Tours. The Bay Guardians have donated many thousands of hours supporting restoration projects along the bay and in area parks and preserves. The Bay Guardians complete at least six projects in Sarasota and Manatee County each year. New volunteers receive a blue tee shirt featuring the Bay Guardians logo. Each outing includes environmental education and a picnic lunch following the morning project. Please contact Darcy Young at info@sarasotabay.org if you are interested in becoming a Bay Guardian.